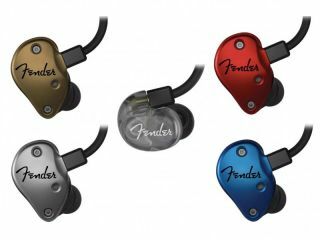 Fender launches five-strong range of in-ear monitors | What Hi-Fi? Legendary guitar manufacturer Fender acquired Aurisonics in 2015 and has now used its technology and engineering know-how on a range of headphones. Better known for its electric guitars and pro audio products, the new range of Fender headphones consists of five models, and is aimed at musicians and music fans alike. It's not the first legendary guitar brand to get in on the headphone market, following Gibson's acquisition of WOOX Innovations from Philips. The DXA1 (pictured top, middle) is Fender's entry-level model and uses custom 8.5mm titanium micro drivers. Fender says they’re capable of delivering “crystal-clear, distortion-free audio” and are designed more for offstage listening. Moving up the range brings us to the FXA2 which have a 3D-printed body and use 9.25mm precision drivers with a ‘Groove-tuned port’. Fender says using these drivers with the port allows the in-ears to produce “crisp treble and enhanced bass response”. Claiming to eliminate up to 22dB of external noise, they're aimed a little more at the pro market. Next up the range is the FXA5, which uses a dual balanced armature array as well as the Groove-tuned port in an effort to deliver “the perfect balance of transparency, ambience reduction and clear headroom”. The Fender FXA6 have been fitted with a patented hybrid-dynamic tuned balanced armature array tweeter, and a 9.25mm precision driver and Groove-tuned port. Finally at the top of the range there’s the FXA7 (above) which uses a patented hybrid-dynamic and balanced armature array: a pair of tweeters coupled with a 9.25 precision driver and Groove-tuned port. All pairs can be comfortably driven by a smartphone and come with detachable MMCXi silver-plated low-oxygen cables. They also all feature a slimline housing which claims to fit 95 per cent of ear types (apologies if you're in the 5 per cent...). UK pricing has yet to be released but US prices for the first Fender headphones start at $99 for the DXA1 and rise to $499 for the FXA7.